Also to C.E. and to church with G.
I believe "C.E." stands for "Christian Education" but I'm not certain. And I'm still puzzling as to whether Lennie is attending the Methodist Episcopal Church or whether he is attending the Presbyterian. By now you can see that Lennie has stopped referring to his female friend as "you know" and feels comfortable to note her by her first initial "G". Lennie is more fortunate than we. He does not need to set the clock ahead for Daylight Savings Time. Took G home after show. Frank's birthday was agoing to have big dinner at Ollies. "Frank" is Frank Albert Davis, Lennie's brother. Frank, born in Illinois, is older than Lennie by ten years. According to the 1900 Census, Frank is a barber and resides at home with Lennie's family. "Ollie" is Flora Olive Davis Schulz, Lennie's sister. She and her hubby, Charles Schulz, own a home nearby in Wakefield. The 1900 census shows Charles as being a grocery salesman. Lennie has missed the big event in Wakefield today. 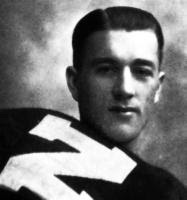 Future football player Clarence Swanson is born this day in Wakefield, Nebraska. Swanson will someday be inducted into the College Football Hall of Fame. You can read more about Swanson here. Got a letter from Lew yesterday. I don't know much about Ellis Paulson except that the 1900 census says he was born December 1878. That means he is currently 19, going on 20. He is one of Lennie's "older" friends. Lew Walden is also a friend from Wakefield, recently moved to Phoenix after finishing high school. He and Lennie have been corresponding by letter.